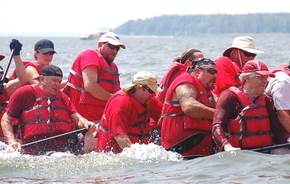 When I was the Neuse Riverkeeper, I was contacted by the organizer of the first-ever Dragon Boat Race in beautiful Oriental, NC. Didn’t know much about Dragon Boats or the racing of them at the time, but heck, it is a boat, it is on the water, so it had to be a good time. That first race experience set the hook. Even though my team, the “Dragonkeepers” swamped our dragon boat at the end of the first race, it was a great time, and I wanted to get into other races. I was so impressed by the sport that I wanted to see if I could get further involved. That is what led me to begin developing the sport in the Carolinas as well as learn more about the logistics of running the races. What is your favorite memory in the sport so far? That would actually be the first race when our team capsized. Being that part of my job involves taking water samples, I just figured by capsizing the dragon boat, I could get 22 samples simultaneously. But in fact, every experience with dragon boat racing has been enjoyable, and have made for great memories. It is a great way to spend a few days with teammates and also getting to know the other teams that are racing. Sure, they are opponents at race time, but the camaraderie is a huge part of the memories being made. I am just looking forward to many more memories to come. You know, everyone wants to win, and I am no exception. You could say that I have a bit of a competitive spirit. But at the end of the day, when the races are over, your arms are tired, your body is sore, it is all about a sport that allows people to have a great time and build great relationships. 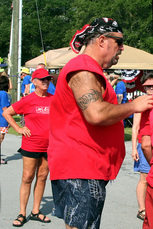 Everyone who enters a dragon boat race is a winner. It is also rewarding to be associated with a group of truly dedicated professionals who make every experience for every paddler and drummer one they will treasure. What do you see for the future of the sport in North Carolina? The sky is the limit for dragon boat racing in NC…and for the Waterkeeper Alliance. We have the water, we have the great weather (most of the time), we have great people, all of whom enjoy the outdoors and new ways to enjoy the environment around us. Plus, the focus by many residents in the Carolinas is to look for “greener” ways to enjoy this world, and that fits perfectly into dragon boat racing. Human power propelling a 45 foot long boat through the water…how much “greener” can you get? Why do you see dragon boating as a good fit for organizations like the Waterkeeper Alliance? Waterkeeper Alliance is a worldwide organization which licenses Riverkeepers and Waterkeepers around this planet we call home. Every “Keeper”, as we call them, is dedicated to preserving the waterway over which they provide protection. Dragon boating is such a natural fit simply because it is on the water, and it is not a threat to the water quality. Being non-profit organizations, “Keeper” programs are also always looking for new ways to raise funds to help protect their water. Dragon boat racing, organized and managed by the likes of High Five Dragon Boat provides a resource to allow for some needed funding while providing a fun way to spend a couple days on the water. But other organizations should hop on this bandwagon as well. You won’t be disappointed, and that is a promise. 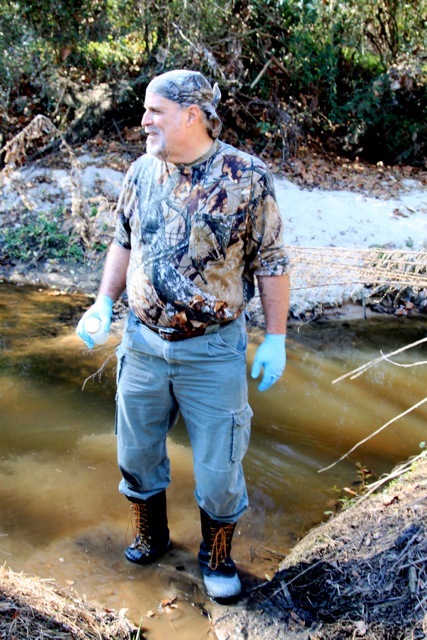 Water is a very important resource to Larry Baldwin, which is what led him to become a Riverkeeper and now working for Waterkeeper Alliance. That love of water led him to enter the first of many Dragon Boat Races in his region, which has now led to further expanding the sport in the Carolinas and specifically to other Riverkeepers.